At approximately 40% more efficient than a condensing boiler an air source heat pump is a great way to save money and the environment. For every 1KW of electricity fed into an air source heat pump you could get at least 3KW of heating energy out. It’s a myth that this technology is not suitable for the British weather. 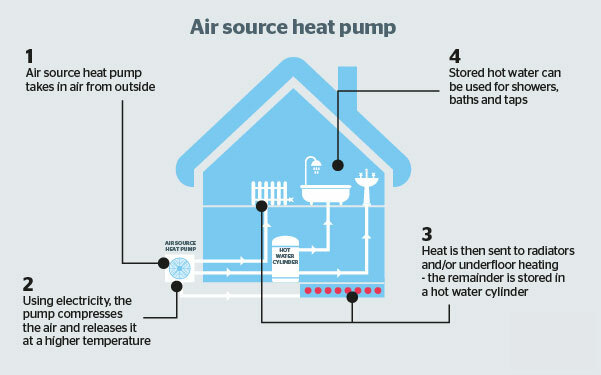 Air source heat pumps can produce water temperatures of up to 60°C in ambient temperatures as low as -25°C. Have a look at the diagram on the left for a basic overview of how this is carried out. Furthermore, by installing an air source heat pump you will be eligible for the Renewable Heat Incentive or RHI scheme. This is a government initiative to reduce carbon emissions and reward households who move away from fossil fuels to heat their homes. Working in a similar way to the Feed-in-Tariff for solar photovoltaic (solar PV) systems, owners of heat pumps will be paid according to the total heat load of the property in kilowatt hours, for seven years tax-free.